A nice alternative to Coconut Macaroons. Preheat oven to 350 degrees F (175 degrees C). Grease a 9×13 inch pan. In large bowl, mix together the cake mix, butter and 1 egg. Mixture will be crumbly. Press into the prepared pan. In another bowl, mix together the sweetened condensed milk, vanilla and 1 egg until smooth. Stir in 1 cup of the coconut and pecans. Spread the mixture evenly over the prepared crust. 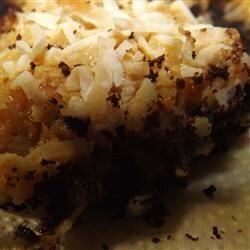 Sprinkle remaining 1/4 cup coconut over top. Bake for 30 to 35 minutes in the preheated oven, or until golden brown. Cool on a wire rack before cutting into bars.